Over the past two years, Louisville is the only school in the nation to have back-to-back trips to the College World Series of baseball in Omaha, Nebraska. A school that stands out as a perennial contender clearly has a culture of winning, which Louisville applies to all of its athletic teams. So in what regard does Louisville baseball predicate its culture of winning? How has Coach McDonnell created a championship culture in Jim Patterson Stadium? There is an old sports saying that Louisville teams seem to love: “Defense wins championships.” For Louisville baseball, it all starts right there. Combined over these past two CWS seasons, the Cardinals gave up two or fewer earned runs in 76 of the 132 games they played. In over half of the games Louisville has competed in over the past two years, the opponent has only scored twice. That sets the bar in how to win, by not letting the other team score. While fielding plays a major part in defense, it starts with the pitching staff, and that is something Coach McDonnell has placed an emphasis on in his time at Louisville. In his eight years as Louisville head coach, McDonnell has produced five Conference Pitchers of the Year. Last year, the pitching staff was phenomenal. They were led by sophomore sensation Kyle Funkhouser, who set a school record and was tied for first nationally with 13 wins on the season. The Cards sealed the deal with the highest draft pick Louisville baseball has ever produced: closer Nick Burdi, who was taken in the second round by the Minnesota Twins. Winning 23 of the last 29 games of the season last year, the bullpen had a 2.16 earned run average. Overall, the pitching staff had a 2.41 ERA in the last 29 games with 248 strikeouts in 258 innings. The Louisville pitching staff ranked fifth nationally in strikeouts per nine innings played with 8.4, 12th nationally in hits allowed per nine innings played with 7.40 and 20th in ERA with a 2.80 over the whole season. It doesn’t stop there. A good defense holds a lead, and perhaps no team in the nation is better at staying composed than Louisville. Louisville was 43-0 last season when leading after the eighth inning. Going back to May 2012, Louisville is 98-0 when entering the ninth inning with a lead. Including this year, the Cardinals have only lost twice when scoring at least five runs or more in a game. They were 39-0 last year and were on a 55 game streak with that trend before falling 8-6 to perennial contender Cal State Fullerton at the beginning of the season. Overall, Louisville baseball is predicated around great pitching, smart field play and maturity. Louisville doesn’t look to win games 14-12, they look to win 4-2, and with another cast of lights-out pitchers, this year should be another grind for Louisville’s opposition. Louisville is not necessarily “Boom Ville.” Last year, the Cards hit 32 home runs, but that only accounted for 32 of the 417 runs the Cardinals scored that season. Dan McDonnell is meticulous and methodical in his approach to the game, and one of the Cardinals’ strengths is their ability to manufacture runs. It is a nuance of the game that takes a true chess player to understand. It’s not about getting every batter at the plate home; it’s about using all your batters at the plate to get at least one person home, then building upon that. Of the 417 runs scored last year, 376 were batted in. The Cardinals had 636 base hits, including 115 doubles and 19 triples. A testament to their ability to manufacture runs is their use of other ways to progress a runner around the bases. At the end of the year, Louisville ranked second nationally in stolen bases with 133 on the season. They were also ranked sixth nationally in HBP’s, or hit by pitches, with 109 on the season. Getting hit by a pitch is an automatic trip to first base. Of their offensive efficiency, Louisville was ranked second nationally in stolen bases (133), fifth nationally in runs (417), sixth in HBPs (109), 12th in hits (636) and 33rd in scoring at 6.2 runs per game. Last year’s Cardinals were 38-3 when out-hitting their opponents. Yet, perhaps the biggest acknowledgement regarding their ability to win without flashy offense was their 10-12 record, when their opponents had more base hits than them. Being able to win and score without getting as many hits as the other team is as hard as it sounds. Louisville’s ability to manufacture runs without base hits is a testament to McDonnell’s coaching. Of all the sporting teams at Louisville, Dan McDonnell’s baseball team could make an argument for the overall best. The CWS is the equivalent of the Final Four or the Bowl Championship Series, and to be the only team in the country to go back-to-back the past two years is a feat that should be held with higher regard by Card Nation. The success is all possible because of the influx of players. McDonnell has spoiled himself with the perfect fluctuation of talent. Each and every year, he has the perfect cast of win now, win in the future type of players. Every year he’s had a constant core group of talented, veteran seniors. But never so many that the program is going to fall off with their graduation. He typically also has a slightly larger, sometimes more talented, group of juniors that have a balance of experience and guidance they can provide. A good chunk of said juniors do not return as seniors because they are too good not to go pro after their junior season. Often, like this year and last, there is a large and very talented class of underclassmen. Standout sophomores, like last year’s Nick Burdi and Kyle Funkhouser, who are extremely talented but don’t have the pressure of leading the team because they are still so young, help ensure the future of the program. Then there is the large freshmen class. A good chunk won’t contribute right away, but will ensure the future of the program and get to learn from the been-there, done-that upperclassmen. But there is always a freshman or two who are complete studs and become the tipping point for the Cardinals’ success. McDonnell’s top-tier recruiting never leaves him in a hole for the next year. For every star he loses, a star emerges; for every veteran he loses, a new veteran is there to lead. Experience is at a constant, and success comes to follow. 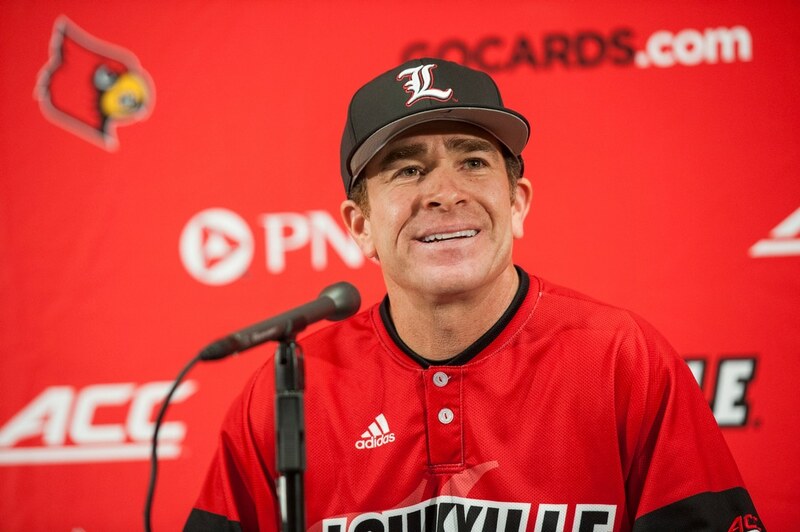 Since McDonnell has been head coach of the Louisville baseball program, winning is all Card Nation has known. In his first season on the job in 2007, he took Louisville to its first ever CWS appearance. He led them to a, then, school record 47-win season and was named Coach of the Year by Rivals.com. In his eight seasons as head coach, Louisville ranks seventh nationally in wins with 359 over that span. Louisville has produced 18 All-Americans, 61 all-conference selections, five conference Pitchers of the Year and three conference Players of the Year. He has also produced professional athletes. 40 Cardinals over his eight-year span have signed professional contracts into Major League Baseball. The Cardinals have won five conference regular season titles and two conference tournament championships. On its way to three CWS appearances, Louisville has hosted six different rounds of NCAA postseason baseball, Regionals in 2009, 2010, 2013 and 2014 and Super Regionals in 2007 and 2014. Louisville may be a basketball town, but as March winds down, another Cardinals team is just getting started, and Dan McDonnell’s baseball team is getting used to playing long into the summer.